A huge bust in New Jersey was announced by authorities early Thursday who claim that they have demolished a profitable opioid mill that pushed thousands of doses of deadly drugs on the daily from a “luxury” apartment” down the street from the famous Red Bull Arena in Harrison. The State Attorney General Gurbir Grewal announced Thursday that they had arrested three suspects accused of leading the operation, which had been selling heroin and fentanyl branded with stamps, including “Tom Brady” and “El Chapo.” The police have linked 227 overdoses, including 84 deaths back to those particular stamps. According to the police report the operation was supplying 15,000 doses of fentanyl and heroin every day. The authorities believed the operation was being run by an Irvington man, identified as Timothy Guest, 45, with help from William Woodley, 27, of Belleville, and Selionel Orama, 25, of Cedar Grove. Authorities said Timothy had been arrested and held Thursday pending a detention hearing while Woodley and Orama were released pending trial, it is not yet clear if the suspects have retained attorneys. 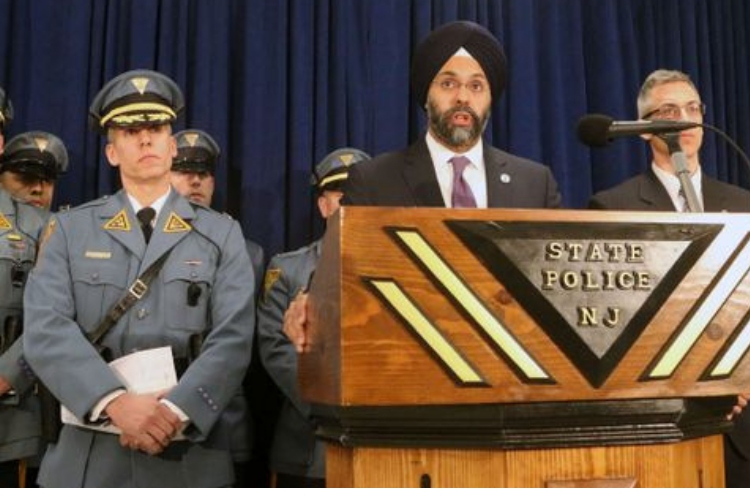 Grewal claimed the opioid mill was first discovered by the State Police-led opiate task force, which had been established by a $2.8 million grant from the U.S. Justice Department. According to the investigation reports, authorities had been surveilling the Harrison Station Apartments last week when they saw their suspect exit the lobby of the apartment complex with a black duffel bag before entering a Cadillac sedan. As Guest drove off state troopers attempted to pull him over; however, he tried to flee the scene, hitting to police cars in the process. The chase shortly ended, and authorities were able to arrest Guest. Woodley and Orama quickly after had attempted to flee the Mill building but were stopped by state troopers. Detective announced that they had discovered 150 bricks of fentanyl in the duffel bag, and later came across three kilograms and one kilogram of heroin laced with fentanyl and another 500 bricks of the deadly fentanyl, along with “drug milling equipment” like grinders and respirators. The three men are being accused of operating a narcotics production facility and a variety of distribution charges. The main suspect Guest is also facing charges of eluding police. New York and New Jersey state police are warning opioid users and their families to be cautious and aware of the “brands” connected with the Harrison drug mill. According to Grewal drug users within the state can exchange their laced or non-laced drugs with most police departments and county prosecutor’s offices in return for treatment. Authorities are still investigating the mill to see if they have any connections with other states.